Happy November! 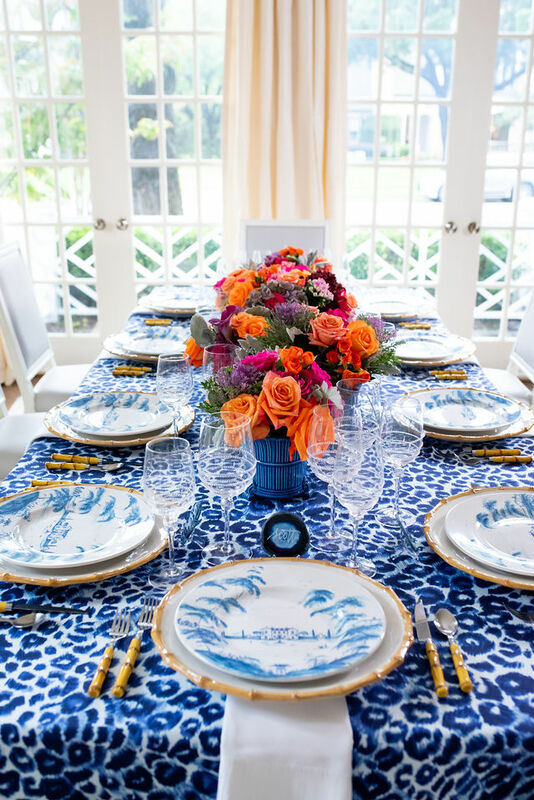 I’ve been waiting until today to share this gorgeous Blue and White Thanksgiving Tablescape! You know there is nothing I enjoy more than setting a beautiful table. 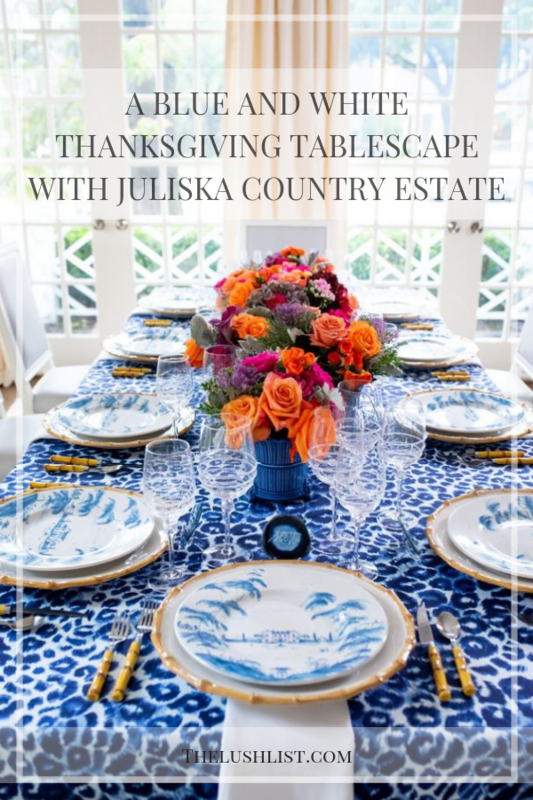 The beautiful Juliska Country Manor pattern was the inspiration for this gorgeous blue and white tablescape. Over the past year or so, I’ve been moving back to my original love: Blue and White. Our first two homes were full of gorgeous blue and white import pottery, fabrics and rugs. When I redecorated our Family Room last year, I went back this direction and am continuing to move that way full tilt! Get ready for some great home updates with more blue and white! 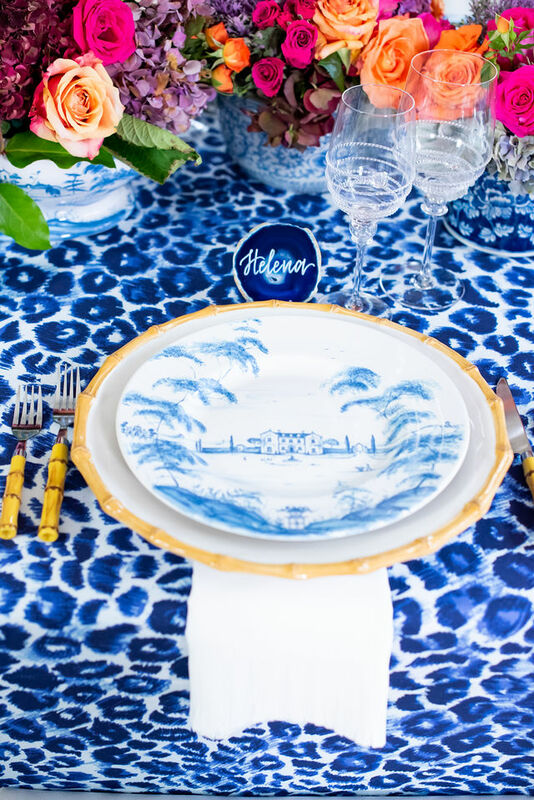 This tablescape was originally created for Kappa Tablescapes in partnership with Juliska, IBB Design and The Garden Gate. I’ve been contributing to IBB Design Magazine this year and love to work with the owner Shay Geyer. You have seen glimpses of it if you follow me on Instagram. 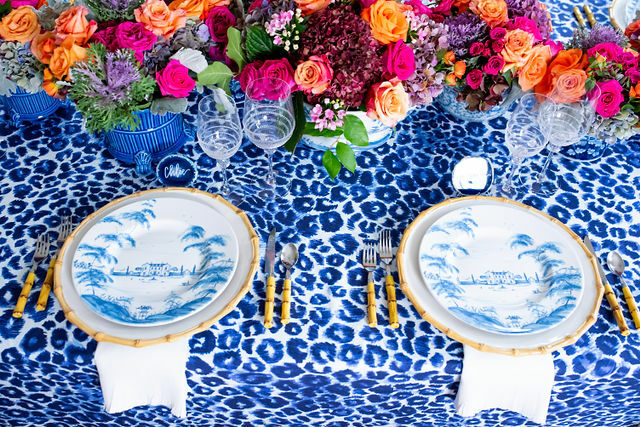 This gorgeous leopard tablecloth is from Shay’s new line of fabrics. It is a showstopper as you can see! I love the combination of the Country Estate in Delft Blue with the Classic Bamboo, both from Juliska. 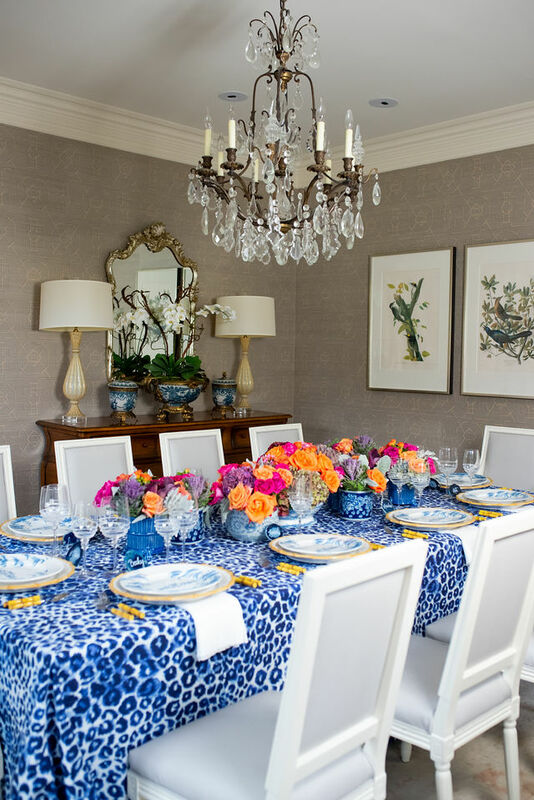 I used the Classic Bamboo pattern in my Easter Tablescape this year as well. I’ve been using them as my everyday pattern. I never get tired of them. The beautiful flowers from Junior Villanueva at The Garden Gate, Dallas’ finest floral and event designer. 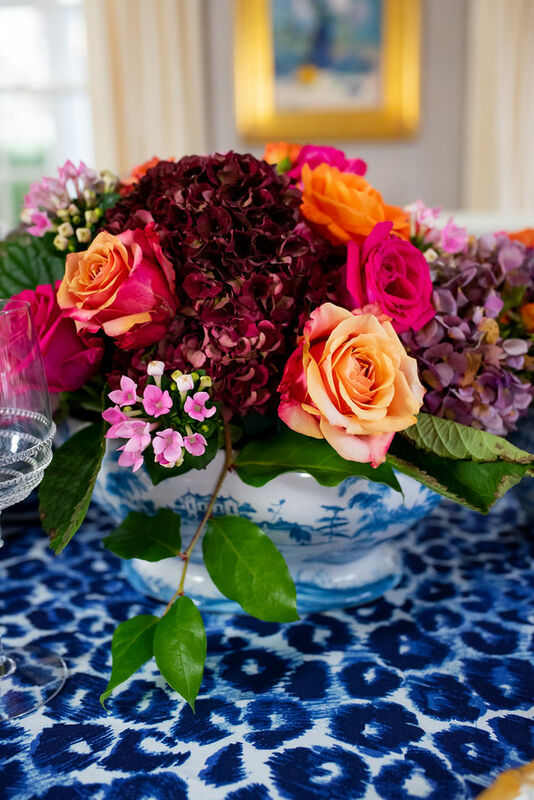 He brought to life my idea of using pinks, purples and orange to create a beautiful fall feel for a classic blue and white tablescape. I’ve so enjoyed having this tablescape and seeing it everyday! I’m so inspired by this color palette. It has also been so welcome on the gray rainy days we’ve been having. 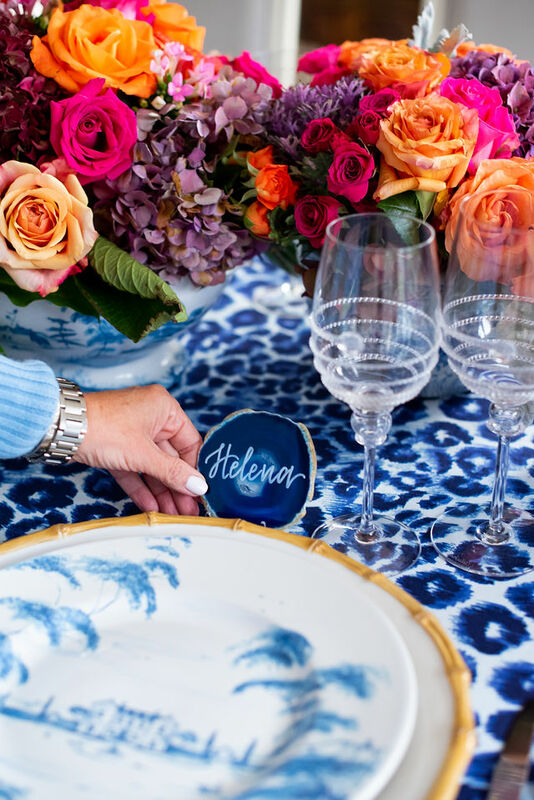 The beautiful agate name cards were created by Madeleine at Madeleine Calligraphy. Madeleine is a dear friend who I have know since she was in middle school! She is very talented as you can see. You can contact her here for beautiful custom projects. 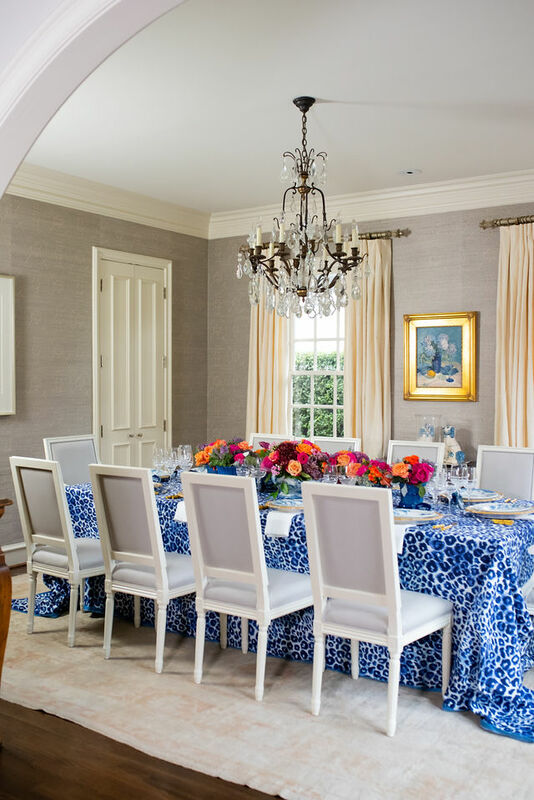 She and her mother, designer Rosanne Beck, are having a fabulous open house in Dallas that starts today! Get the details on my Instagram Stories and hers. They are an uber talented duo! I hope this has inspired you to create something beautiful for Thanksgiving this year. You can see my other Thanksgiving tablescapes inspiration from 2016 and 2017 here and here. 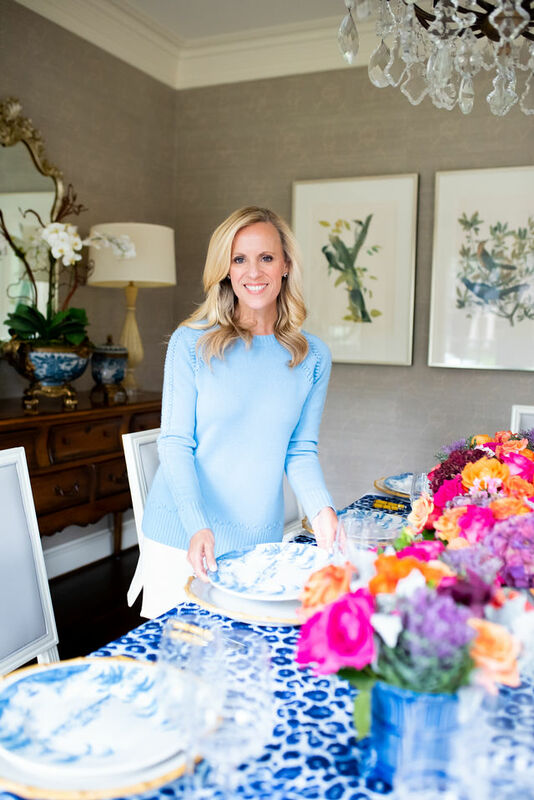 Find all my holiday tablescapes here. 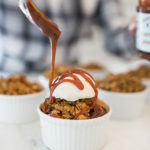 PS – Be sure and register for my newsletter so you don’t miss any of my tips, tricks, recipes or Gift Guides that are coming soon! You’ll also receive copies of my 2 eBooks filled with recipes when you subscribe! Thank you to Juliska, IBB Design, The Garden Gate and M. Calligraphy for their partnership on this post. All selections and opinions are my own.